May the Tenerife links in the two tables below help you to find answers faster. Information on basic facts and statistics about the biggest Canary island. Underneath, view the island by clicking on the link to find your way around. Click here and use this map. 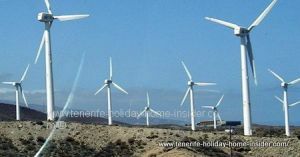 Latest news of the biggest Canary Island for its North wanted now? What would this Atlantic Island be without its Canadas del Teide with their unique weather? Its name and its Guanche origin. 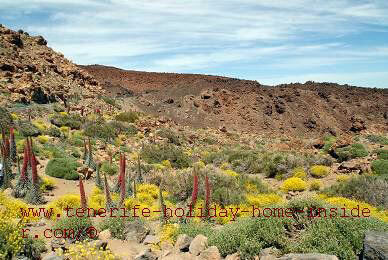 No doubt, Mount Teide with its huge terrain of its sunken crater is highly attractive and very prominent on its island. Therefore, we shall also call it the Teide Island. It is also a fortunate one. This was already recorded by Pliny the Elder, over 2000 years ago. The name stuck because of its gentle climate and Elysian winds. 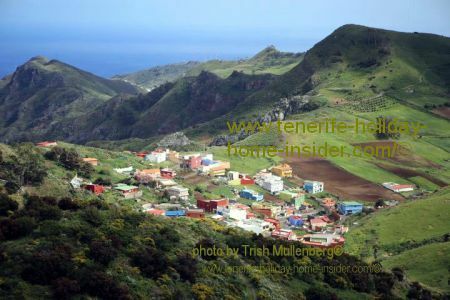 Others like to call it the isle of the Guanche, Achineche, Chinerfe or Chenerfe. Learn more about the Guanche culture via a link under 'Realejos' in the navigation bar. Attractions for all tastes while the Lago Martianez appeals to all. Lago Martianez Lido of Puerto de la Cruz. From fast food, take away paellas, charcoal grill guachinches to designer cuisine gourmet restaurants. From shopping like in the good old days with best customer care to buying online in big centers and malls. Expats from Britain who love the island of Chenerife. Admire a natural, volcanic rockery by the Cañadas crater with indigenous plants. Make out the white and yellow Teide daisy Argyranthemum on the bottom left. However there, also spot purple or blue and yellow Teide Eryseum, as already displayed before together with Tajinastes. The red Tajinaste Echium Wildpretii is the most stunning of all wildflowers of the Canary Islands. There are 4000 endemic types of flora on the island. Their medicinal herbs were known by the Guanche, already. 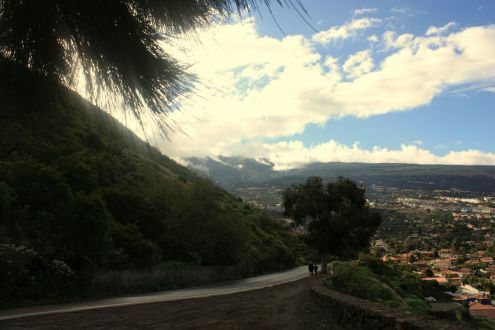 Mind that Teide with snow, as portrayed above, doesn't mean that exotic fruit and vegetables can't be grown on the island. To the contrary, even jack fruit grows in the open in the Botanical gardens of Puerto de la Cruz. Endemic Tabaiba and Agaves stretch over square miles of land in the most Southern and Eastern regions of the island. 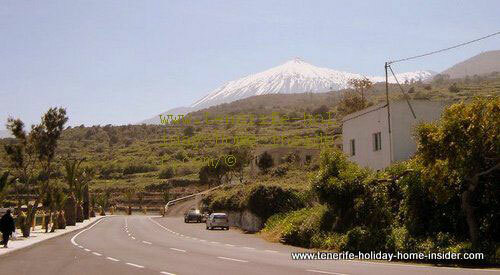 There, they are more exposed below Spain's highest volcano and peak the 3718 Mount Teide. Windmills on the Southeast coast. Many windmills whose modern turbines generate electric power are proof of much steady wind in those parts of the island. Wind somewhat may cool the heat as well. So what about the North of the island? The lush and green north has protected valleys and mountains where trade winds deposit their clouds already at about 400m above the sea. Mist is very common from 4 p.m. onward on slopes. A green roof of Tabaiba and moss is not unusual in the North. They are not only in Teide's national park. Lava deposits surged in many places after eruptions and not all are black. A torrential rain disaster in winter 2009 was caused by volcanic stones from ravines at Playa Jardin Puerto de la Cruz. Different geological volcanic make-up with sand colored rock slabs by El Medano shores. The fauna of the biggest Canary Island knows no snakes but special free creatures that frolic in the sea. Birds include falcons that are also encountered in the mossy, fern clad forests of Laurisilva as well as in lofty heights of the Orotava valley, at the Teno , at Adeje and in the UNESCO biosphere the Anaga mountains. Indeed, Playa Teresitas in the North East is the main beach of Santa Cruz capital is so different from all other beaches on Teide Island. It is one of main beach attractions of Spain, without any doubt, while it's not even touristic. The island's water supply come from ocean clouds, above all. They cling to the many pines. Rain water which is more rare can be stored in basins and reservoirs. The moisture that is captured from clouds drips into the ground and is channeled into pipes or more rarely by an aquaduct, as seen here behind Lidl Orotava on the TF5. Explosives clear the way to the water sources in the Galerias which are owned by a few families on the island. The gallerias (water mines) go as deep as 200m into subterranean rocks. Abandoned mines may be full dangerous gas which cannot be smelled or seen. Sciences: University of La Laguna where studies of geology and volcanology excel. Tourism of the biggest Canary Island. The island is great for restoring your health and, your energy. Walking in high altitudes where you may also get to by organizing your own Teide excursions is of known benefit to certain heart diseases. The greenery of its forests is good for the eyes. So is the iodine rich air by its beaches. English studies Government is doing everything that every child learns it from small on, nowadays. However, I can absolutely vouch for best results by English schools on the island. Dia de Canarias for celebrations and facts about the Tenerife autonomy as well as tax incentives. 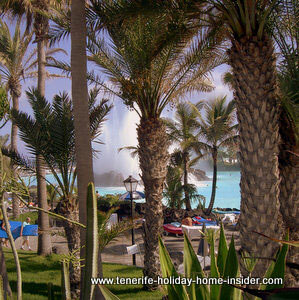 A holiday home on the biggest of all Canary Islands is worth it in any way. Portrayed above is a fully equipped Studio (condominium) for self catering holidays. 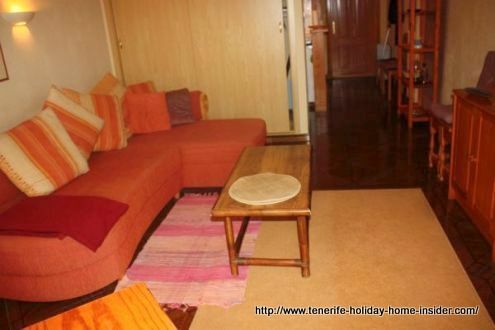 However, this is a Tenerife apartment for long lets, unless you want a shorter break. The latter is only possible and recommendable for a maximum of two people that are part of family or friends of the owner. However, there are various reasons why this flat is ideal for an elderly retired person for extended rental. It may be available in January 2019 again. Did you know the huge Island New Zealand has black beaches as well? Beaches at the west coast of Auckland, New Zealand’s largest city, surprise with diversity. Nestled aside the Waitakere Ranges their rugged coastline interchanges with endless black iron sand beaches. Get travel tips and insights about New Zealand and its people. Down load planner for free vacation ideas on your Maui vacation to teach you shop for the best deals on activities, lodging, transportation, and food. Design your holiday to your lifestyle in the paradise of Maui Island.